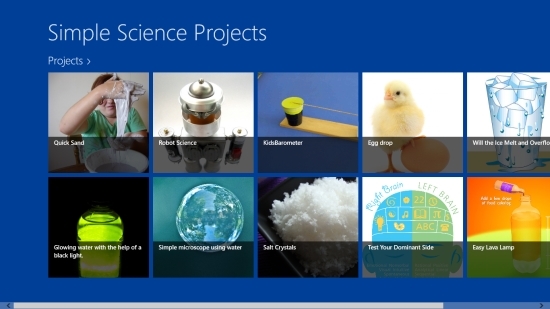 Simple Science Projects is a free Windows 8 Science app that brings out some amazing projects ideas for kids. The app guides you through the techniques and processes involved in making very simple yet interesting science projects. Using this app, kids can learn to make science models such as Barometer, Kaleidoscope, Robot, Baking Soda and Vinegar Volcano, and many more. There are some more exciting projects such as making Crazy Clay and Invisible Ink as well! The projects given in this free Windows 8 Science app will not only help you make good science models, but also satisfy your curiosity behind their surprising aspects. 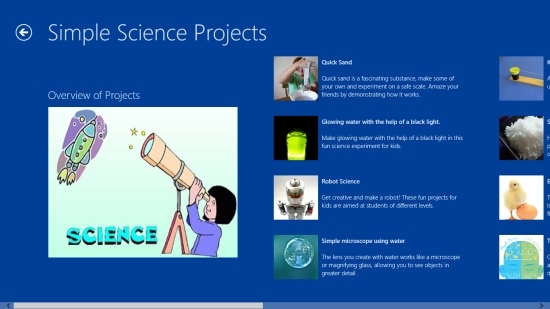 Simple Science Projects is freely available in Entertainment category of Windows Store. 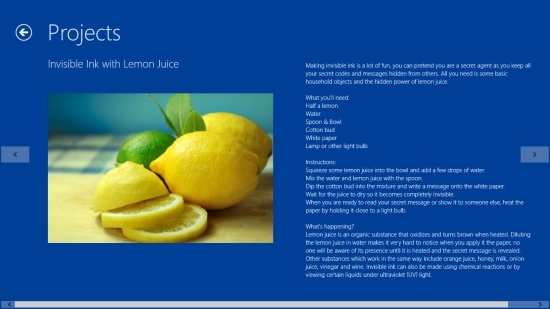 Let’s see how you can use this Free Windows 8 Science app to make some amazing science projects. This app is extremely simple to use and very well describes the method of making various science models. As you land on the app’s main page, you will see various science projects, being displayed with picture and names. Click on the title to open the app further. The second screen will display a list of the projects with pictures and a little description. Click on any tile to open it. The app will display the list of materials required and instructions to make that project/ model. You can flip through various projects given in the app using the left and right headed arrows. Also try POPSCI, Learn n Play Chemistry. Simple Science Projects is an exciting app to learn making simple science projects. Try this app, make amazing models, and surprise your teachers and friends. Share your feedback via comments. Get Simple Science Projects here!